There are many “Blot” techniques in molecular biology such as southern blot, northern blot, eastern blot and western blot. The principle and process of these blot techniques are similar. Southern and northern blot are nucleic acid blotting techniques, of which southern blot is for detecting a specific DNA sequence in DNA samples and northern blot is to study gene expression by detection of RNA (or isolated mRNA) in a sample. Eastern blot is used to analyze protein post translational modifications (PTM) such as lipids, phosphomoieties and glycoconjugates. Different from those blot technique described above, western blot, also called protein immunoblot, is an analytical technique used to detect specific proteins in a given sample such as cell lysates, tissue homogenate or extract. It is widely used in molecular biology. The bases of western blot identification are two distinguishing properties: molecular weight and antibody binding specificity. It uses gel electrophoresis (usually SDS-PAGE) to separate native proteins by 3-D structure or denatured proteins by the length of the polypeptide. And then transferred the protein sample to a membrane (typically nitrocellulose or PVDF), where they are probed with labeled-antibodies and stained with dyes for visualization and directly identified by N-terminal sequencing, mass spectrometry or immunodetection. Immunodetection involves the identification of a protein through its reaction with a specific antibody. Through spatial resolution, this method provides molecular weight information on individual proteins and distinguishes isoforms, alternate processing products, and other post-translationally modified forms. The basic principle of western blot are protein electrophoresis and ELISA. Electrophoresis is a commonly used method for separating proteins on the basis of size, shape or charge. Proteins are large molecules with charge, they can migrate in the polyacrylamide gels under electric field. The migrating speed depends on the molecular weight of proteins: heavy proteins move slower than light proteins. This is just like the runners running through a jungle, the polyacrylamide molecule in the gel is like the branches along the sideline, which could slow the runner down. The bulky runner would be affected more by the “branches” than the small runner so that they runs slower. That’s why we could separate those runner proteins. If we load the mixed protein samples on one side of the gel, add a constant electric field on the gel, and let the protein migrating on the gel for a period of time, the mixed protein sample could be separated into different bands on gel (Figure 1). If we put several proteins with known molecular weight under the same electrophoresis condition along with the tested samples as control, we may further measure the molecular weight of proteins within the tested samples by compare the location of sample proteins with control proteins. These control proteins are commonly known as molecular weight marker or protein ladders. Figure 1. Protein electrophoresis: proteins separated under electric fields based on different molecular weight. When the proteins were successfully separated, we still use an electric field to transfer the protein bands onto another polyvinylidene fluoride (PVDF) or nitrocellulose (NC) membrane for the following detection. 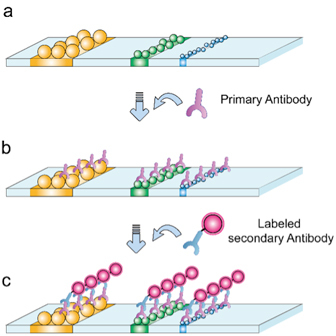 After the proteins band transferred onto PVDF/NC membrane, we use anti specific protein primary antibodies to probe the sample protein, and then use a labeled secondary antibody for further visualization (Figure 2). This procedure is basically an indirect ELISA process (know more about indirect ELISA at ELISA Guide). Creative Diagnostics provides a variety of high quality primary antibodies and secondary antibodies for western blot use. Figure 2. Indirect ELISA procedure. To probe and visualize the separated protein bands. Gel: usually made of polyacrylamide, need precast before western blot. Gel comb: used for toothing one side of the gel as sample loading area. Gel cassette: used for gel formation. Gel knife: help to move the gel from cassette. Electrode chamber: used for holding the gel cassette and cathode buffer. Sponges: protect the gel and membrane, keep a wet and conductive condition. Filter paper: protect the gel and membrane, keep a wet and conductive condition. PVDF/NC membrane: receive the proteins. Rolling brush: exclude bubbles within the multilayer membrane. Washing dish: hold the membrane for washing. Other general equipment such as shaker/incubator for antibody incubation and imager for display the gel result are not listed here but also important for western blot experiment. Figure 3. 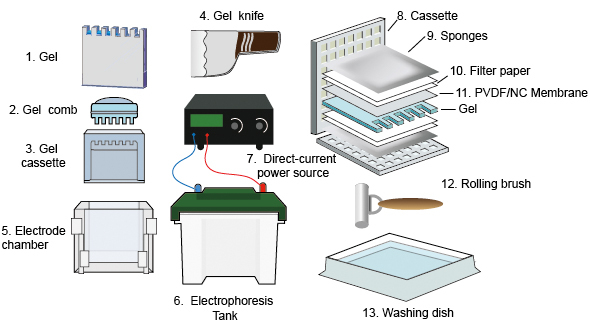 Western blot equipments. Detailed information of each steps are discussed in Western blot protocols. Although western blot is relatively an old, mature technology, there are still researchers working on it to upgrade this technique. Hughes et al. from University of California (UC) Berkeley, successfully couple western blotting with single-cell analysis, which enables the simultaneous analysis of ~2,000 individual cells. Single-cell protein analysis techniques lack resolution, sensitivity or specificity, or require protein tagging. Western blotting avoids these pitfalls but is not amenable to single-cell analysis. This progress enable us use western blot to investigate single cell proteins. Their array-based technique uses a slide coated with polyacrylamide gel and patterned with thousands of micro wells, into which a cell suspension is seeded by gravity-driven cell settling, resulting in single-cell occupancy in 40–50% of the wells. Intracellular proteins are then solubilized in the wells, subjected to thin-gel electrophoresis and immobilized. Subsequently, the serial stripping and re-probing of antibodies enables multiplexed analyses of proteins.